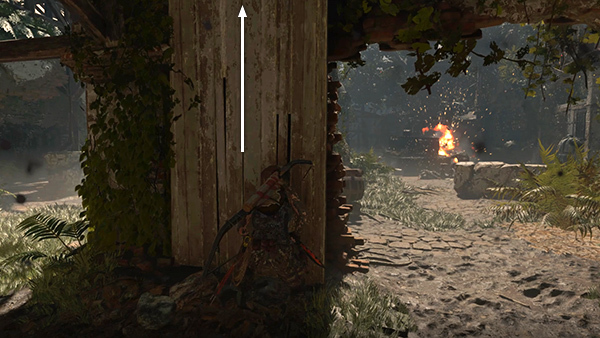 ...and melee attack the one on the right. 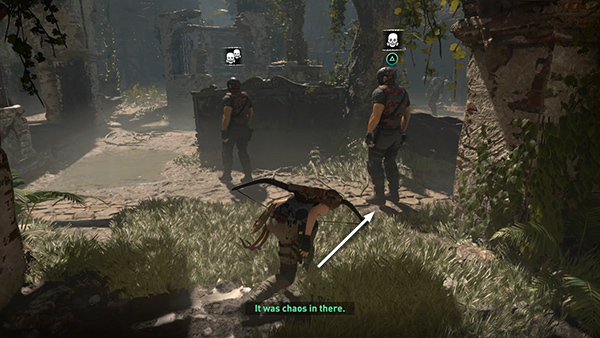 Then press Melee again for a chained takedown. Now, move back into the alcove where you started and use the mud camo. 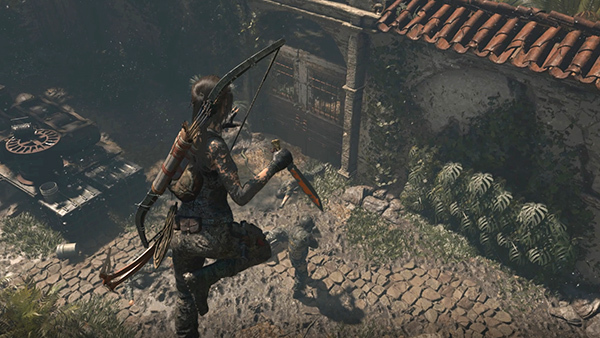 You may not need it if you use this strategy, but if Lara is spotted, she'll have a better chance of hiding again if she's already muddy. Head for the right side of the alcove (when facing out toward the courtyard). 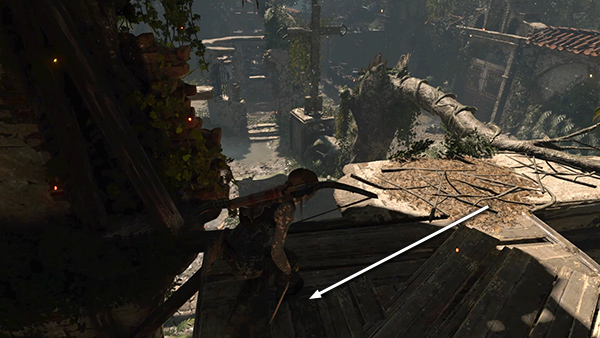 Now shoot the man on the far left with a Fear Arrow. He's got a good angle on the others and he's holding a powerful gun. ...onto the ledge above the alcove. 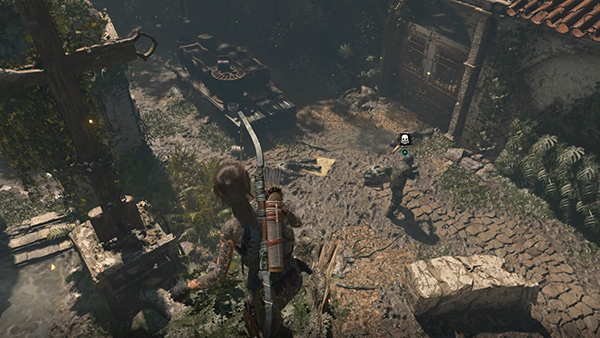 If you move back into the shadows, you can see what the enemies are up to, but they can't see Lara. ...to serve him a heaping helping of death-from-above. 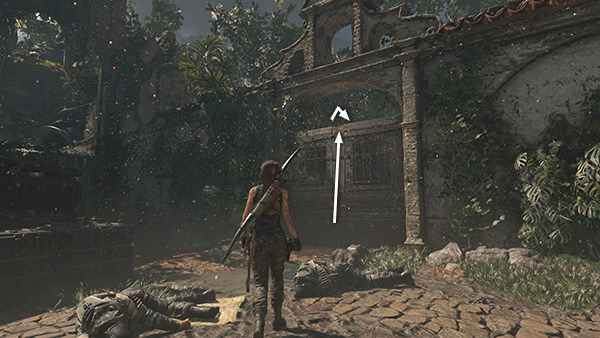 If nobody approaches, you can try dropping down and making your way around to the far end of the courtyard via the various shrubs and vine-covered walls. 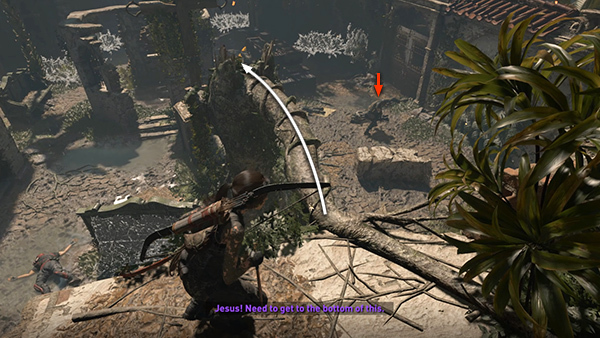 Or jump from the end of the fallen tree onto the cross, then to the top of the gazebo. Move around to the far side of the gazebo and hopefully spot the last soldier on guard here. 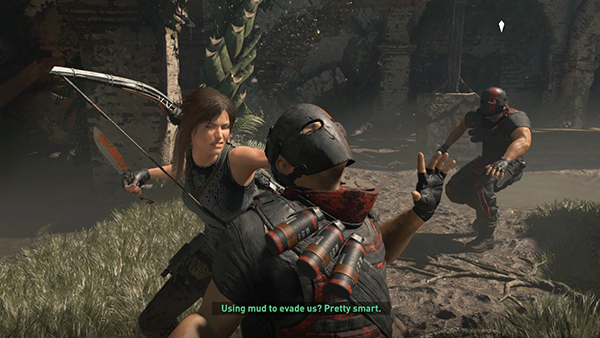 Make sure nobody's watching (yellow in Survival Instinct) and press Melee to drop down and attack. 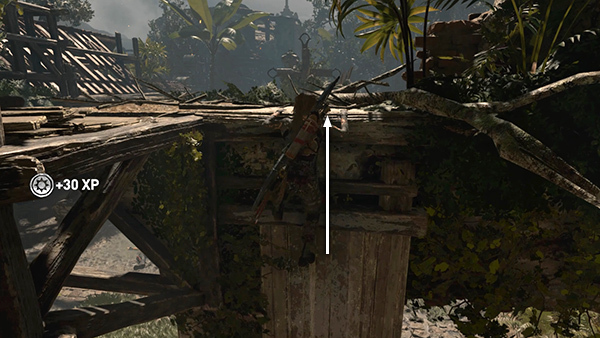 If he's not there, or if there are multiple enemies left, you can instead drop down inside the gazebo. 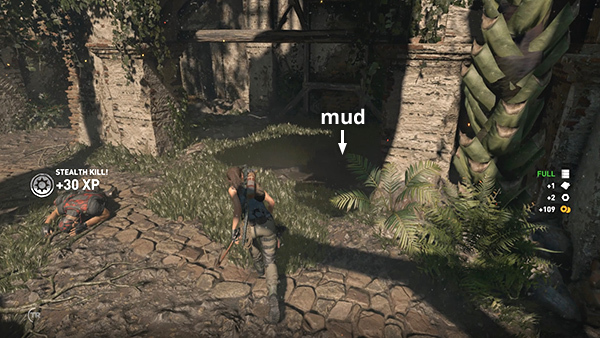 There's another mud patch there if you need it. 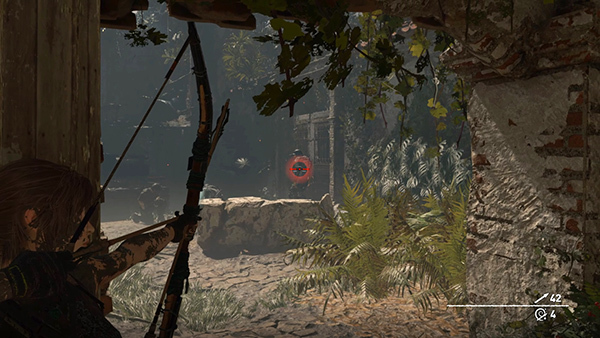 Then sneak around, using bushes and vines for cover and stealthily picking off the few remaining men. 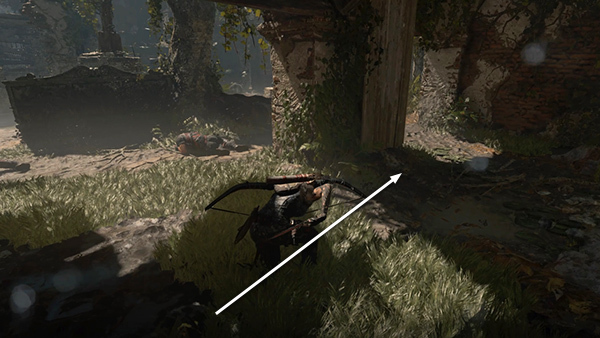 NOTES: If you don't have the Serpent's Fury skill and/or resources to craft Fear Arrows, you can still use the mud camo, and there are plenty of places to hide and climb around to evade searchers. 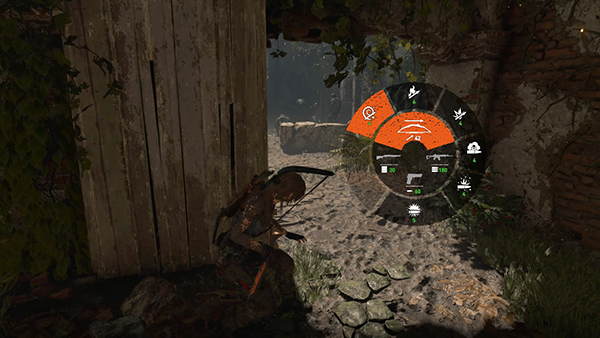 Use the other stealth attack skills, and bring out the big guns, fire arrows, molotovs, and petrol bombs if you have to. 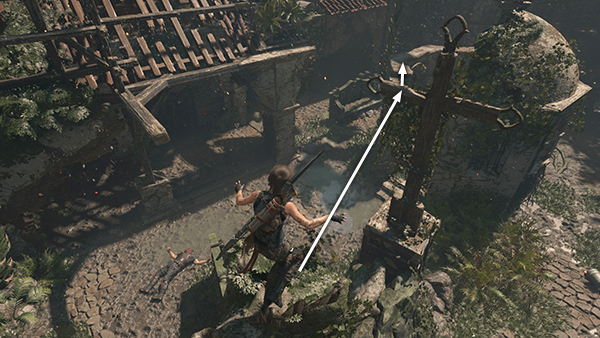 You'll be able to replenish your ammo here and after the next sequence. 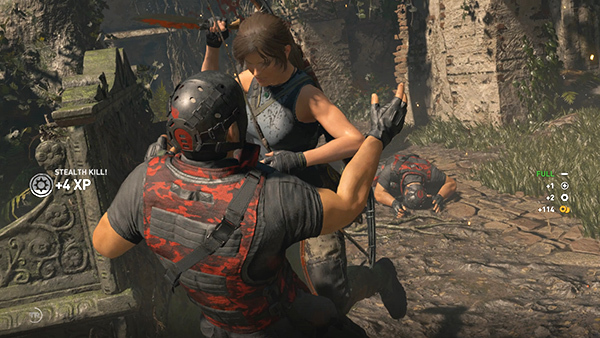 When they're all dead, Lara will stand up and contact Jonah on the walkie-talkie. He says he's in a nearby cane field. That's where you're headed next. 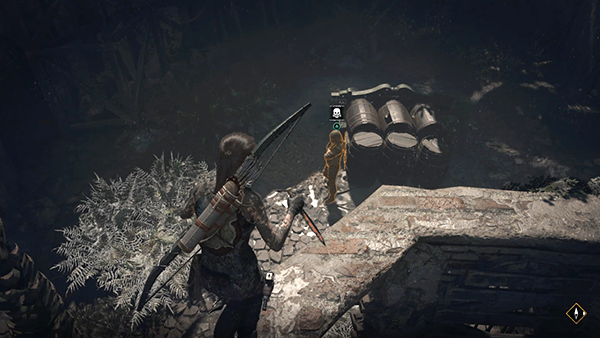 Loot the bodies, collect supplies, and climb over the wooden door on the northeast wall.